The Play That Goes Wrong is a phenomenon, a full-on slapstick comedy performed and written with such a heads down let’s gallop on through this verve that it’s hard not to get swept along. If there’s a joke within a quarter mile radius or a bit of physical comedy that could have been left out then they are having it. Everything from the cast to the set is used to the maximum, and it’s great fun to experience. From the moment you arrive at the Duchess Theatre, you are immersed in the play. My favourite line might still be ‘Does anyone have a dog we could borrow?’ and that was whilst still in the pre-show drinks. The cast use audience and backstage alike to drain all the comedy possible from their situation and even though the plot might not be trailblazing and at times the jokes can seem a little relentless, I have rarely sat in a theatre with so many people laughing so hard. There are a couple of genius comedy moments where the crowd roared with laughter and some brilliant technical moment from the cast and crew. The audience were genuinely crying with laughter. The premise is simple enough – Cornley Polytechnic Drama Society is putting on another of their ill-fated productions and guess what – everything goes wrong. It literally does what it says in the title – and then some. There are criticisms, of course, it could be shorter and at times it feels a little padded, but there are brilliant positives also, over and above everything already mentioned the humour although slapstick and silly doesn’t rely on double entendres and is almost never bawdy in that old school ‘Carry on…’ sort of way. And the women almost give as good as they get and occasionally steal the show. Special mentions for Henry Shields as Chris Bean, Henry Lewis as Robert Grove and Leonard Cook as Trevor Watson and to both brilliant women – Charlie Russell and Nancy Wallinger – but actually the whole cast is bundles of superlative and everyone hurls themselves into their performances with evident joy. Big round of applause to Director Mark Bell and Designer Nigel Hook for pulling off a show that turns the West End into Edinburgh Fringe Festival for a small moment – in a really good way. The show still has a charming intimacy and a feel of recreation in the performances. 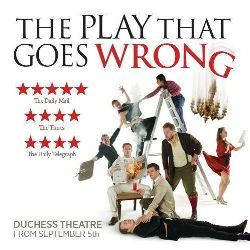 The Play That Goes Wrong has already surpassed all expectations since its humble beginnings at The Old Red Lion, and gone on to win Best Comedy awards from What’s on Stage and The Oliviers. It’s now booking at The Duchess until 2016 and looks set to run and run. This is one of those plays that drama students will be kicking themselves for not having written, even though there are a zillion versions of this sort of play kicking around fringe theatre, but what Mischief Theatre have done to make theirs special is absolutely go for it, with full force and all guns blazing – and they’ve pulled it off. Kudos. Given 5 stars from The Daily Mail, called a ‘Gut-busting hit’ by the New York Times and with celebrity endorsements from the likes of Ant and Dec as the ‘funniest show we’ve seen! If you can get a ticket go’, what are you waiting for?